This article describes the new version of the MIRC teaching file system (TFS) running as a plug-in on CTP. This article is intended for people interested in installing MIRC. The Tomcat-based versions supported both teaching files and clinical trials. In the clinical trials application, however, the extra complexity of the Tomcat installation was an impediment, so a special clinical trials application was developed called <b>CTP</b>. CTP contains its own embedded servlet container, providing the necessary capabilities from Tomcat without the need for a separate installation step. It also contains a more capable processing facility and anonymizers that implement the DICOM Supplement 142 de-identification profiles. For more information on CTP, see [[CTP-The RSNA Clinical Trial Processor]]. As experience was gained with CTP, it became clear that it could serve as the servlet container for MIRC, providing both new features and simplified installation. To support MIRC, numerous extensions to CTP were implemented, the most important of which was the development of plug-ins, which provide processing capabilities outside the normal CTP pipelines. MIRC TFS is implemented as a single plug-in in this framework. The new MIRC implementation is denoted with the <b>Z</b> prefix. The starting release identifier has been reset to <b>1</b>, so the first release is designated <b>Z1</b>. In early 2012, the MIRC Committee changed the name of the teaching files application from MIRC to TFS. In the context of this article, MIRC and TFS are used as synonyms. The new MIRC TFS implementation is denoted with the <b>Z</b> prefix. The starting release identifier has been reset to <b>1</b>, so the first release is designated <b>Z1</b>. The CTP/MIRC TFS implementation is recommended for all new MIRC TFS installations. The Java 1.5 (or better) JRE must be present on the system. Java 1.6 or 1.7 is strongly recommended because 1.5 has reached its end of life and is being sunset by Oracle/Sun. Java is available through the [http://www.oracle.com/technetwork/java/javase/downloads/index.html Java] website. Note that only the JRE is required, not the JDK. The Java 1.7 (or better) JRE must be present on the system. Java 1.8 is strongly recommended. Java is available through the [http://www.oracle.com/technetwork/java/javase/downloads/index.html Java] website. Note that only the JRE is required, not the JDK. MIRC requires that the [http://download.java.net/media/jai-imageio/builds/release/1.1/ Java Advanced Imaging ImageIO Tools] be present on the system. It is critically important that version 1.1 of the ImageIO Tools be installed rather than version 1.0. You should get the jre version (for Windows, it has a name like jai_imageio-1_1-lib-windows-i586-jre.exe), not the one for the CLASSPATH, which does not include <b>-jre</b> in the name. MIRC requires that the [http://download.java.net/media/jai-imageio/builds/release/1.1/ Java Advanced Imaging ImageIO Tools] be present on the system. It is critically important that version 1.1 of the ImageIO Tools be installed rather than version 1.0. You must get the jre version (for Windows, it has a name like jai_imageio-1_1-lib-windows-i586-jre.exe), not the one for the CLASSPATH, which does not include <b>-jre</b> in the name. [[Image:MIRC-installer.jpg|thumb|right|400px]] The installer for the teaching files application is available on the [http://mirc.rsna.org RSNA MIRC site]. Click the <b>Download Software</b> link in the left pane to obtain a list of all the available software. The <b>TFS-installer</b> available on the site includes CTP and all the libraries required to run the teaching files application. 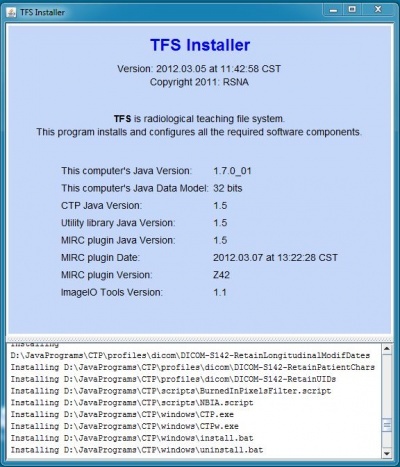 [[Image:MIRC-installer.jpg|thumb|right|400px]] The installer for MIRC TFS is available on the [http://mirc.rsna.org RSNA MIRC site]. Click the <b>Download Software</b> link in the left pane to obtain a list of all the available software. The <b>TFS-installer</b> available on the site includes CTP and all the libraries required to run the teaching files application. Once Java and the ImageIO Tools are installed, download the installer and place it on the disk on which you intend to install or upgrade the CTP program. Do <b>not</b> run it without downloading it and storing it locally. Note that TFS is not a stand-alone program; it is a plug-in to CTP in the same way that previous versions of MIRC were webapps that ran under Tomcat. Therefore, it is most correct to speak of running <b>CTP</b> rather than <b>TFS</b> or <b>MIRC</b>, so that terminology is used here. * CTP can also be run as a Windows or Linux service. See [[Running CTP as a Windows Service]] or [[Running CTP as a Linux Service]] for instructions. [[Image:UserManager.jpg|thumb|right|400px]] When the program is first installed, two users are provided. One user, with the name <b><tt>admin</tt></b> and password <b><tt>password</tt></b>, is intended for general system administration. The other user, with the name <b><tt>king</tt></b> and password <b><tt>password</tt></b>, has the ability to shut down the server through the browser interface. Both users have the ability to create and modify users and assign privileges through the User Manager, but only a user with the shutdown privilege can grant the shutdown privilege to another user. Most MIRC administrators log in as the <b><tt>admin</tt></b> user. 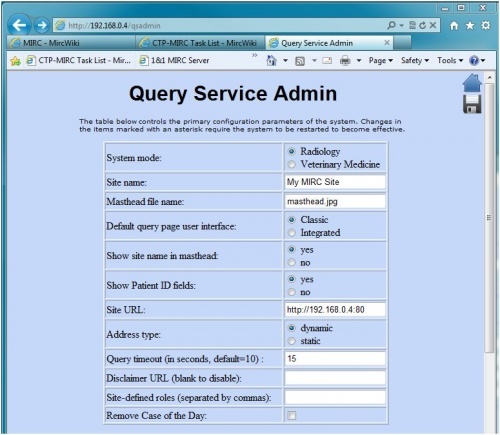 After installing and starting CTP and MIRC, access the query page, click the <b>Login</b> button to log in as the <b><tt>admin</tt></b> user, and then go to the <b>Admin > User Manager</b> menu item. This will display a page allowing you to add and modify users. To start, check all the boxes in the <b>admin</b> user except <b>shutdown</b> and then click the save icon in the upper right corner of the page. The page will re-display, showing that the changes have been made. You should change the passwords of these accounts at this time as well, using the unlabelled column at the right side of the table. If you need to create accounts for other users, use the blank line at the bottom of the table. Each time the save icon is clicked, a new blank line will appear. When all the changes have been made, click the home icon in the upper right corner of the page to go back to the query page. After installing and starting CTP and MIRC TFS, access the query page, click the <b>Login</b> button to log in as the <b><tt>admin</tt></b> user, and then go to the <b>Admin > User Manager</b> menu item. This will display a page allowing you to add and modify users. To start, check all the boxes in the <b>admin</b> user except <b>shutdown</b> and then click the save icon in the upper right corner of the page. The page will re-display, showing that the changes have been made. You should change the passwords of these accounts at this time as well, using the unlabelled column at the right side of the table. If you need to create accounts for other users, use the blank line at the bottom of the table. Each time the save icon is clicked, a new blank line will appear. When all the changes have been made, click the home icon in the upper right corner of the page to go back to the query page. 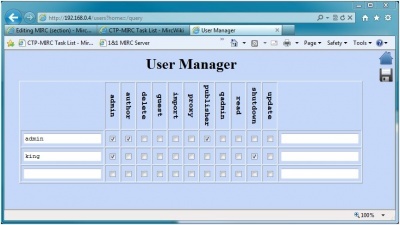 MIRC has two user interfaces, the <b>Classic UI</b> and the <b>Integrated UI</b>. These present almost the same functionality in two different ways. Each only shows the user those functions that the user's privileges allow him to access. TFS has two user interfaces, the <b>Classic UI</b> and the <b>Integrated UI</b>. These present almost the same functionality in two different ways. Each only shows the user those functions that the user's privileges allow him to access. On the Query Service Admin page, you can also control which other TFS sites are available to be queried. After making any changes, click the save icon and then click the home icon to return to the main query page. TFS provides authoring tools to create MIRCdocuments that are accessed through the user's browser. When authoring a MIRCdocument, a special SVG viewer must be installed on the author's computer to allow images to be annotated. The free Adobe SVG viewer can be obtained from [http://www.adobe.com/svg/viewer/install/main.html the Adobe SVG Site]. Adobe no longer supports the SVG viewer, but it works just fine. At the bottom of the Adobe page, there is a table of versions for different operating systems. Adobe hasn’t updated the page since the late Pleistocene, and the last Windows version listed is XP, but it has been tested successfully on Vista and Windows 7 using IE7, 8, and 9, as well as the latest Firefox and Chrome. In addition to plugins like the one that implements MIRC, CTP supports sequences of processing steps called pipelines. Pipelines are described in [[CTP-The RSNA Clinical Trial Processor]]. MIRC employs pipelines to support the reception of DICOM images for the File Service, the DICOM Service, and the TCE Service. The MIRC pipelines are described in [[MIRC Pipelines]]. In addition to plugins like the one that implements MIRC TFS, CTP supports sequences of processing steps called pipelines. Pipelines are described in [[CTP-The RSNA Clinical Trial Processor]]. MIRC employs pipelines to support the reception of DICOM images for the File Service, the DICOM Service, and the TCE Service. The MIRC pipelines are described in [[MIRC Pipelines]]. CTP can be configured to support LDAP for user authentication. See [[CTP Authentication Using LDAP]] for details. CTP can be configured to support OpenAM for user authentication. See [[CTP Authentication Using OpenAM]] for details. The new MIRC TFS implementation is denoted with the Z prefix. The starting release identifier has been reset to 1, so the first release is designated Z1. The Java 1.7 (or better) JRE must be present on the system. Java 1.8 is strongly recommended. Java is available through the Java website. Note that only the JRE is required, not the JDK. MIRC requires that the Java Advanced Imaging ImageIO Tools be present on the system. It is critically important that version 1.1 of the ImageIO Tools be installed rather than version 1.0. You must get the jre version (for Windows, it has a name like jai_imageio-1_1-lib-windows-i586-jre.exe), not the one for the CLASSPATH, which does not include -jre in the name. 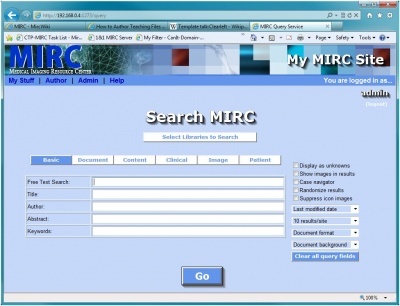 The installer for MIRC TFS is available on the RSNA MIRC site. Click the Download Software link in the left pane to obtain a list of all the available software. The TFS-installer available on the site includes CTP and all the libraries required to run the teaching files application. CTP can also be run as a Windows or Linux service. See Running CTP as a Windows Service or Running CTP as a Linux Service for instructions. After installing and starting CTP and MIRC TFS, access the query page, click the Login button to log in as the admin user, and then go to the Admin > User Manager menu item. This will display a page allowing you to add and modify users. To start, check all the boxes in the admin user except shutdown and then click the save icon in the upper right corner of the page. The page will re-display, showing that the changes have been made. You should change the passwords of these accounts at this time as well, using the unlabelled column at the right side of the table. If you need to create accounts for other users, use the blank line at the bottom of the table. Each time the save icon is clicked, a new blank line will appear. When all the changes have been made, click the home icon in the upper right corner of the page to go back to the query page. TFS has two user interfaces, the Classic UI and the Integrated UI. These present almost the same functionality in two different ways. Each only shows the user those functions that the user's privileges allow him to access. CTP can be configured to support OpenAM for user authentication. See CTP Authentication Using OpenAM for details. This page was last modified on 8 November 2017, at 16:20.